All transactions are safe and secure with a reliable history in online purchasing behind each of our associates. 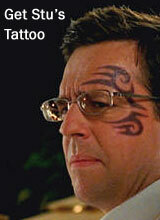 Buy the Hangover 2 Stu Tattoo - Temporary Mike Tyson Tattoo to own Hangover 2 clothing and merchandise. Create the ultimate Stu Hangover 2 costume with a fake tattoo version of his facial artwork. It's perfect for Halloween costume parties or simply to let everyone know that, like Stu, there is a little demon lurking inside of you too. Hey, let's face it, it's better to get this Mike Tyson Hangover temporary tattoo than to unexpectedly wake up in a Bangkok hotel room and discover that you have been inked with the permanent version of the tribal design. Even Stu Price would have probably preferred this fake replica. In addition to the Hangover 2 Stu Tattoo - Temporary Mike Tyson Tattoo above, browse the Hangover 2 Clothing Gallery for more apparel like men's and women's clothes, kids shirts or hoodies.